You usually find hipsters lurking underground, but last night they were 38 floors-high for Sushisamba's third birthday-party. 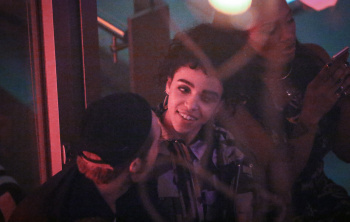 It was a carnival in the sky, as colourfully dressed Brazilian dancers roamed around, taking some of the attention off a very cuddly Robert Pattinson and FKA Twigs. Slabs of latin-infused sushi circulated as the bar was thrown open with champagne, pisco sours, sake and shochu flowing until the early hours. What's more, Grace Jones hopped up on stage in an incredible Amazonian get-up to perform a string of her hits. Needless to say, no one wanted to descend back down to reality..."
"Cosied up in one corner of Sushi Samba's third anniversary bash in London, the cute couple tried to balance their private life with their showbiz sides; looking blissfully content all the while. 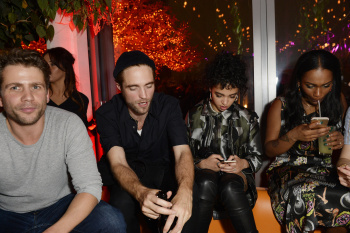 Rob, 29, and his 27-year-old fiancee kept a low profile among a group of friends, chatting away as guests of the amazonian-carnival themed party at on the 38th and 39th floors of 110 Bishopsgate. Music lovers FKA and Rob were treated toa performance by iconic headliner Grace Jones, followed by DJ sets by Jonny Woo, Pam Hogg, Lou Hayter, Hugo Heathcote and Harriet Verney. She looked giddy as she chatted away to him, her hair characteristically cool in a high updo and large earrings to accessorise her ensemble. 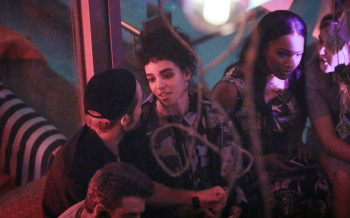 FKA zipped up a camouflage jacket while Rob stuck to a trademark black palette, wearing a backwards cap to conceal his identity. 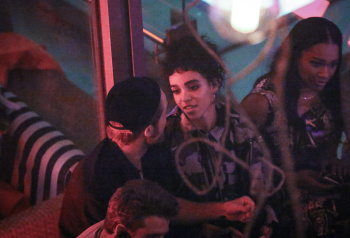 He seemed to look around the venue after choosing one of the most popular venues in London, famed for its Japanese, Brazilian and Peruvian cuisine and unparalleled views of the British capital, to catch up with his girlfriend." 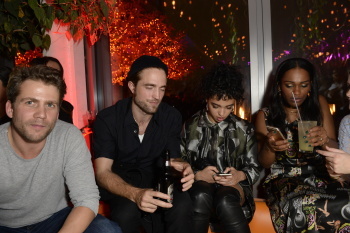 These pics are the same as the ones posted earlier but now HQ. Bigger is better.